Mural restoration and graffiti removal in downtown Los Angeles will begin Tues. 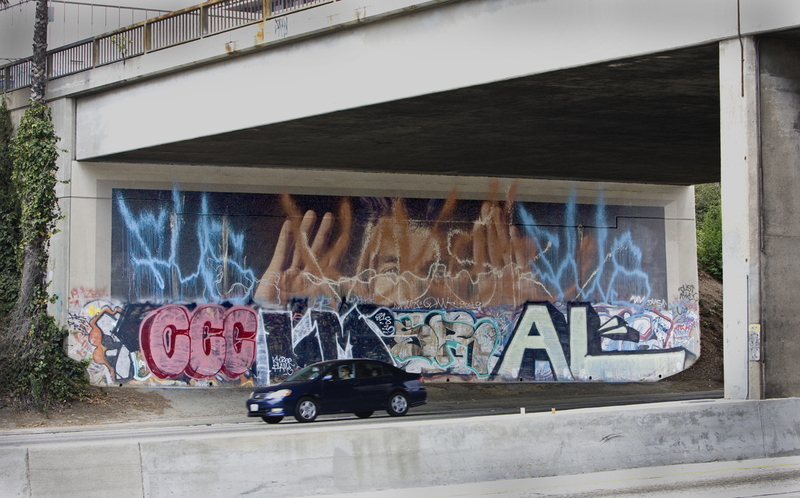 This will be the first 101 freeway mural of 4 that are covered with graffiti. Then, after these 4 are looking good, another 8 murals that are part of this 1984 Olympic Freeway Murals series will undergo gray overpaint removal to reveal the artwork in all their glory. Scott M. Haskins, conservator of fine art at FACL, Inc. (Fine Art Conservation Laboratories 805 564 3438) will be doing the art conservation work and mural restoration treatments. The project will be coordinated and organized by The Mural Conservancy of Los Angeles, Isabel Rojas-Williams, Executive Director (213 291 6900). Kent Twitchell, the original artist, will be collaborating on the project (310 709 2037). Next Tues at 8 am in the morning think of us, with ear plugs in, working on the side of the 101 freeway in downtown LA! This is a very big thing! Downtown LA will be talking. Do you know a media person? Would you please forward them the link to this page? Click NOW on the THUMBS UP if you like this project. This entry was posted in Murals and tagged 1984 Olympic Freeway murals, art conservation, Caltrans, graffiti removal, Isabel Rojas-Williams, Jim Morphesis Monument, Kent Twitchell, mural restoration, Scott M. Haskins. Bookmark the permalink. Interesting post especially at the time of the Olympics. I love the upgrades to a city for these events and these murals were certainly a good idea. I think they should be preserved, restored and prized by the city. Good job. It will be really wonderful to see those murals back in their former glory. It was painful too see those painstakingly created work of art being sullied by the ugly graffiti. Thanks for this info about the murals I see all the time. Good luck and I hope you can keep the graffiti off. Thanks for this urban update on these murals. They are really cool. I love them so much and it hurts to see them covered with graffiti. Keep up the good effort! Great project and love the mural. Here in London we have some good murals but I see Los Angeles has it goin’ on! Fun and interesting project. Cool for a city to care about its art! I want to say your article and the work you are doing is amazing. I can assume you are knowledgeable on this subject. You seem to be THE guy. Nice post. I drive by this every day and have been watching the work be done. I found your website from the “Save Freeway Murals” on the back of your work vests. Thanks for letting me know where to go for more info. That’s the plan Kelly. While I suggest you keep your eyes on the road, thanks for your appreciation. We love it as people honk and wave as they drive by (slowly in downtown traffic). There’s more info at http://www.savefreewaymurals.com. Also you can go on Facebook at follow Mural Conservancy of Los Angeles for the latest. This info was so freakin’ interesting. I did’t know this was going on in LA! Where can I find out more? I drive by these murals all the time and have been watching you work over the last couple of weeks. Really interesting and thanks for your great work. I love the fact that someone is taking back the public art from the graffiti vandals. I love the way this mural looks now… keep it clean!!!!!!!!!!!!! Thank you for the good writeup. I love these types of positive news for the community. Great effort and great project. Thanks for stepping up and being “the guy” to make it happen. Wish we had such cool murals in Italy. There’s nothing “new” happening that I know of in any of the cities in our area of Northern Italy. Hello, I noticed you visited my blog so I’m here to return the favor. And, wow, what a great project! Thanks for contributing so visibly to the improvement to LA and community pride. Well done. Glad you asked the question. The removal of the graffiti requires the stars to align with the proper kind and thickness of paint on the mural; also the proper kind and thickness of a protective varnish layer; also the proper kind and technique of application of the swelling agent of the graffiti paint; also the right temperature of the day makes a difference; also the removal technique with the power washer. So… there you go…. Glad we could entertain you! Honk when you go by. Yes, please feel free to give our office a call ahead of time and we will roll out the red carpet. In fact, we do tours for art history programs from our local colleges. See you soon. Thanks for another excellent article. I drive by this mural everyday, and this week, I get up anxious to drive to work and see your progress. Freakin awesome! What an interesting project! Are you guys simply power-washing this mural? Does it come off that easy?